Civic dignitaries gather for Beating the Retreat at South Shields Town Hall. The South Tyneside community came together this week to pay tribute to those who served in the First World War as part of a national day of commemorations. Civic dignitaries, the Armed Forces community and members of the public gathered for a special service led by Rev Chris Fuller at St Hilda's Church in South Shields to mark 100 years since Britain entered the conflict. 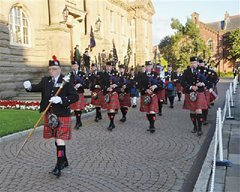 The service was followed by the Beating the Retreat outside South Shields Town Hall, with music from 101 Northumbrian Regiment Pipe Band. And, in line with national 'lights out' campaign, the lights were turned off in the Reception Room, of South Shields Town Hall, at 10pm, as a lone piper played a Lament. The Mayor of South Tyneside, Councillor Fay Cunningham said: "It was wonderful to see so many people come together on this very special day, a day that changed a nation 100 years ago when Britain declared war on Germany. "It is important to recognise the contribution and sacrifices of our servicemen and all those who played their part in World War One, and to remember this historic anniversary with communities around the UK." The event was organised by the South Tyneside Armed Forces Forum and was just one of thousands held across the nation to commemorate the 100th anniversary of the outbreak of the First World War on 4 August. These included remembrance services at Glasgow Cathedral and Westminster Abbey. Households, businesses, public buildings and some of the UK's most iconic structures joined in the national commemorations by turning out their lights. This was in reference to the then-foreign secretary Sir Edward Grey's famous remark on the eve of the outbreak of war in 1914, when he said: "The lamps are going out all over Europe; we shall not see them lit again in our lifetime." The conflict between 1914 and 1918, which became known as the Great War - left 17 million soldiers and civilians dead. Councillor Ed Malcolm, South Tyneside Armed Forces Champion, said: "The Great War changed the face of our nation over the four years it took place. It affected the lives of so many people, not just the soldiers and their families, but wider communities across the UK and beyond. "It is right to commemorate the huge sacrifice people made during this conflict and to remember all those who gave their lives for the peace and freedom we enjoy today. "These commemoration events gave people an opportunity to come together to pay their respects on this very important anniversary, reflect on the impact of this key event in world history and help our younger generation to understand its significance today."